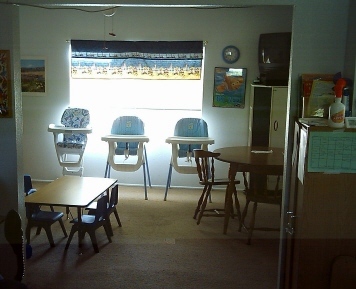 "How do you set-up a daycare?" is the question I hear all the time. This is my attempt to answer that question! This is our front door. 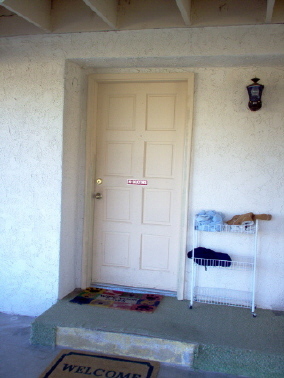 The rack to the right of the door is for the children's shoes, coats, etc. 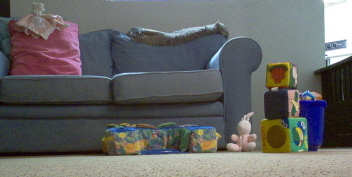 I find it much easier to keep these items outside, then to have toddlers fighting over them all day, LOL! It's also a quick grab for parents to get their child's things on the way out. I also put car seats and diaper bags on the porch, otherwise I would have toddlers in them all day. 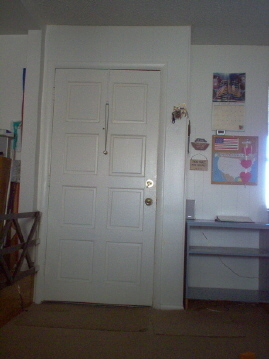 This is the inside of the door. You will notice a bell hanging from it--that's because parents are invited to enter without knocking (my open-door policy) and the bell jingles when someone enters the house. On the blue shelf next to the door is the book where parents Sign-In/Sign-Out their child each day. 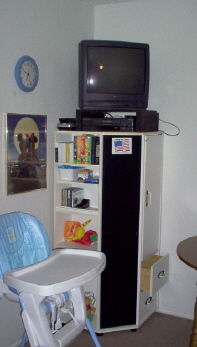 Above the shelf is a calendar, digital clock (for signing in/out) and a bulletin board for notices. When you enter the living room, I have it set-up for the day. Today we are playing with Duplos (in the truck & Duplo board on the table) and the stacking rattles (on the coffee table) for the special toys--following Plan B Curriculum. 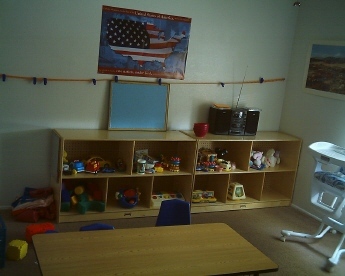 Also, I set up for the infants by setting out the foam seat, soft blocks and toys, and bucket of rattles (visible in the photo below). 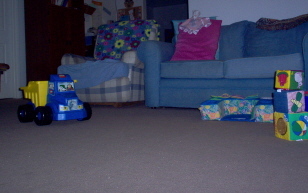 Above, on the left, is the entrance to our playroom (the dining room of our house). 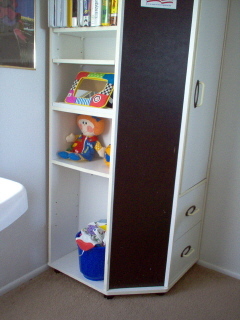 On the right of that picture, just before the playroom entrance, is our Art Cabinet that I keep art supplies in and a child lock on. Taped on the outside of the cabinet is a sheet protector that I can slip our weekly lesson plans into. In the picture on the right is the shelf I was able to purchase through a grant. On the shelf is one-half the toys. Every-other week I do Toy Wash & Swap. This keeps everything fresh and "new" to the children. On top of the shelf is my flannel board (I glued felt to the back of a white board.) Also on the shelf is our CD player and the line goes across has clothespin-type clips and that's where I hang the children's art to show it off. I've had to revise this set-up to accommodate an older toddler. Take a peek at our new set-up here (don't forget to read the story of how this happened above the pictures on that page). This shelf holds our TV/VCR. It's for videos only. It's hardly watched, but nice to have once in a while for Veggie Tales, Teletubbies, Elmo, etc. Also on the shelf is toys and in the drawers are toys that are rotated during our Toy Wash & Swap. The blue bucket on the bottom shelf holds the infant rattles and teethers. I take this bucket to our living room during daycare, where the infants are. 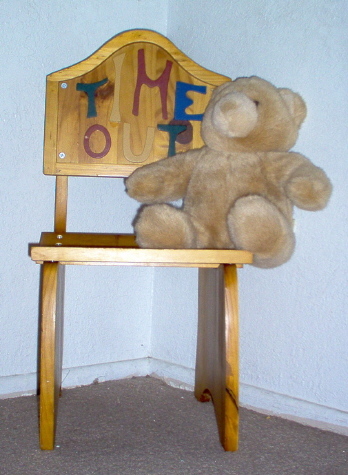 This is our "Time-Out" chair, but any designated spot will work). It's in a corner of the playroom. 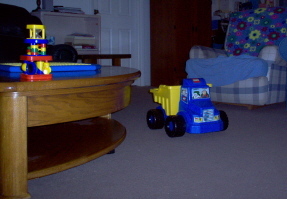 Before I got the chair, I would have the children stand in the corner. When a child misbehaves, he/she is given a warning. If the behavior continues, I place the child in Time-Out and set the timer on my microwave for 1 minute per child's age (a three-year-old gets three minutes). At first, you may have to stay close by to ensure the child stays in time-out. When you do this, DO NOT give the child your full attention! Put your attention on the other children, but stay close and continue to place the child in the chair until the timer goes off. I find by doing this consistently, I soon can place the child in time-out and he/she will stay there on his/her own until the timer goes off. After the Time-Out call the child to you and tell them the behavior was not acceptable and have the child apologize. Sometimes it's rough getting started, but keep with it and be consistent. When you threaten to put a child in time-out, and the negative behavior continues, follow through. For more discipline ideas, check out my Managing Toddlers page.